Displaying a reeded bezel, reference 6305 is nicknamed "Ovettone" due to the likeness of its case to an egg. This beautiful pink gold "Ovettone" is preserved in excellent condition with an arresting lacquer dial. Displaying a stunning mirror-like finish, the dial features three lines of script bearing "Chronometer Officially Certified "at 6 o'clock. This configuration is extremely rare as most dials display "Officially Certified Chronometer" in two lines. It is incredibly rare to discover a black lacquer dial in such pristine condition, no less with such a singular appearance. Preserved in sensational condition, this pink gold Datejust boasts sharp satin finishes on the top of the lugs, as well as a sharp hallmark beneath the lug. The case has developed a light layer of patina throughout, demonstrating how little intervention it has seen throughout its lifetime. This timepiece even retains its original Super Oyster crown. 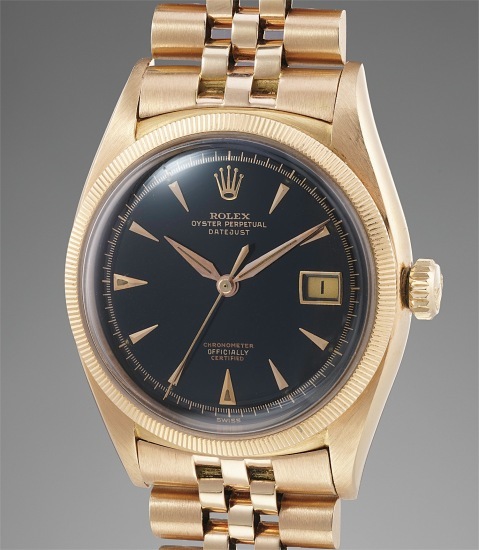 The pink gold Rolex Jubilee is stamped for the first quarter of 1954, corresponding to the year of manufacture.